Plan ahead for your vacation to La Fortuna – Arenal Volcano, Costa Rica and save money while also getting the most of your limited time. This is the perfect combination to create memories during your day in the area. 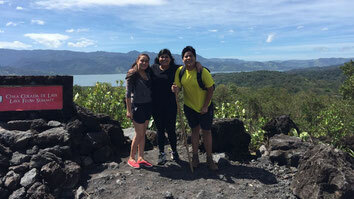 Hiking on the trails of Arenal Volcano National Park. Visit and enjoy the Hot Springs that emanate directly from Arenal Volcano plus a buffet dinner. Around 8:00 am your day full of adventure and excitement begins. 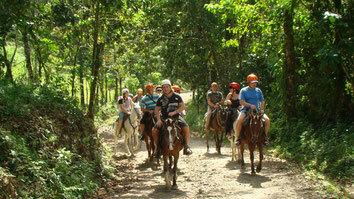 Start off enjoying a ride on horseback along trails through the forest. 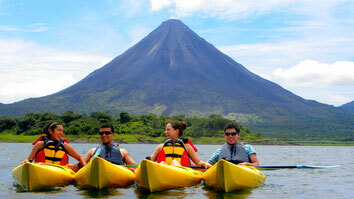 Enjoy the flora and fauna along your tour as well as spectacular views of Arenal Volcano. After a ride on horseback we’ll arrive to an observation platform from where you can continue on a hike to the La Fortuna Waterfall with its 70 meter drop. There you can swim and refresh yourself in its cool crystalline water before beginning your return journey. This activity lasts approximately four hours. Around noon we take you to a restaurant in La Fortuna to enjoy a delicious typical Costa Rican lunch before continuing on with the next activity. After lunch, around 1:30 pm, we continue on in this exciting day enjoying a short tour on kayak in the largest lake in Costa Rica for about one hour. Lake Arenal is an excellent option for kayaking; during the trip you’ll enjoy the diverse flora and fauna of the area with the added benefits of views of Arenal on clear days. Enjoy the peace and tranquility that only comes from being out on the water. Around 3:00 pm we’ll begin our tour of the trails that will get you as close as possible to Arenal Volcano. This tour inside the National Park offers the unique opportunity to see different animals and plants that find shelter in the park’s forest. Our expert naturalist guides will provide relevant information about the history and evolution of the different ecosystems that are found in the national park, as well as the volcano’s history of eruptions. This tour lasts approximately two hours. Available at your request is a visit to the Hot Springs for a well-deserved rest in the hot springs of your choice. 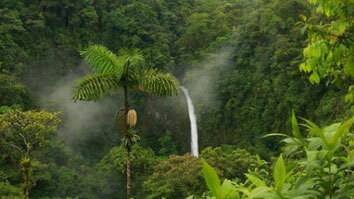 Options include: Baldí Hot Springs, Tabacón, Paradise Hot Springs, or Ecotermales. Enjoy the 100% natural hot springs and the gardens that surround them with Arenal as your backdrop. A dinner buffet is included at the hot springs of your choice. 8:00 am (exact time depending on the proximity of the Hotel where you are staying).